It’s Valentine’s Day, and I’m feeling the Love today–of various kinds: bookish, romantic, and uplifting. Not only is it cupid’s day, it’s Library Lovers’ Day and International Book Giving Day. I’m happy to report that I participated in all three events. At work, I witnessed a wonderful outpouring of love by a whole secondary school for one of their own. It was a lunchtime music event called Acoustica. A girl with special needs and wondrous, seemingly limitless talents sang an original song to her school mates about the heartache and uncertainty of not fitting in. At the end of her song, five boys from her class surprised everyone by presenting her with a long stem red rose each. The audience let out a collective “Awww….” and there wasn’t a dry eye in the place. Now that’s what it’s all about. It was the most uplifting thing I’ve experienced in ten years as a school counsellor. On the home front, I lavished some love on my family. Little trinkets (stationery and a chocolate) for the girls and a gift for my hubby. 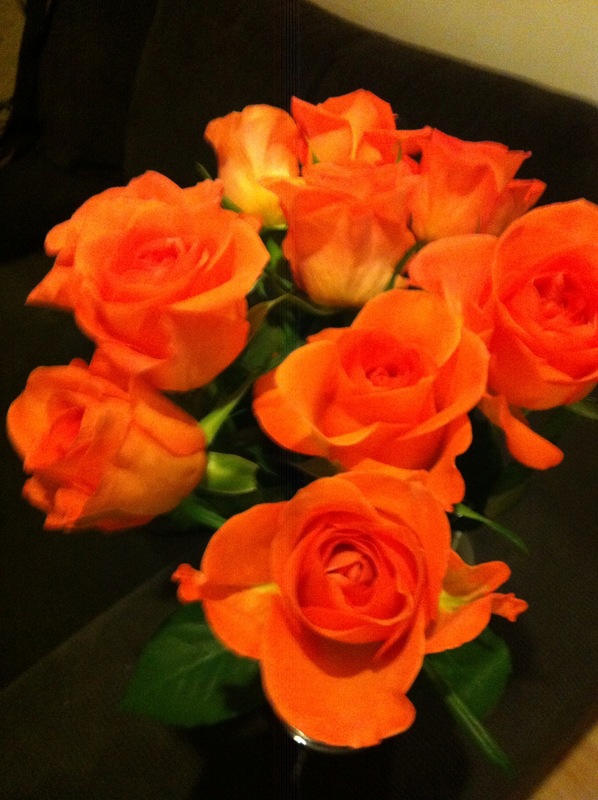 He gave me the coral-coloured roses above and 2 tickets to The King & I. The man detests theatre–especially musicals–but he’s coming with me. How sweet is that? I started the morning by selecting a book from my shelf that I wanted to share with someone. The someone was a book-loving student. I picked her because she was so attentive during my little guest speaker spiel in her English class. (More on that in another post!) I selected a pristine book and wrote a little note of encouragement for her. The look of surprise on her face made my day. I was invited to volunteer in the school library. I got to hand out stickers and let the kids know if they checked a book out, they’d earn a marshmallow and a bookmark. I shooshed a group of rowdy boys (Awesome moment…I did the “I’m looking at you” thing with two fingers) and I caught a couple of blighters who circumnavigated the checkout desk a few times, checking out, collecting a marshmallow, dropping book in chute, picking up another random book, checking it out, collecting another marshmallow and so on. Book rogues! Good fun! Dear Ali. Gaining some catharsis from reading some parts of the Employment Policy of Qld Govt, I found your post an absolute breath of fresh air. Not just did the words inspire me but the way it was written was such a treat. Thank you for a little bit of chocolate in a sea of dry bread. Thanks Michelle! I’m so touched that you read it and commented. Here’s hoping you soon run out of dry reading material.